FutureProspects is a clean, stylish template built with latest bootstrap framework designed for Joomla! CMS. It was designed as a template for business/corporate, but it will suit well in many kinds of projects like product websites, creatives, or blogs. 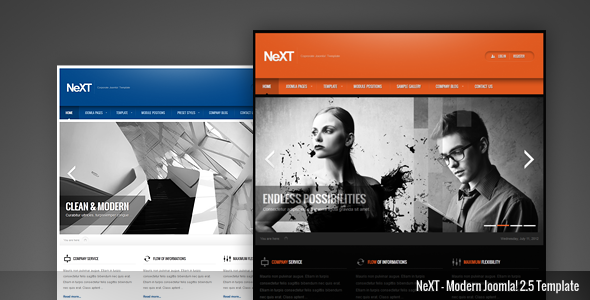 NeXT is a clean, modern template designed for Joomla! CMS with Bootstrap 2.3.x, designed as a template for business/corporate websites, but it will suit well in many kinds of projects. Magnus is a powerful responsive bootstrap Joomla theme for any kind of website blogs, store fronts, magazines, portals,design studios, corporates and any kind of business. Visario is a multipurpose, fully responsive template for Joomla! 3.x. 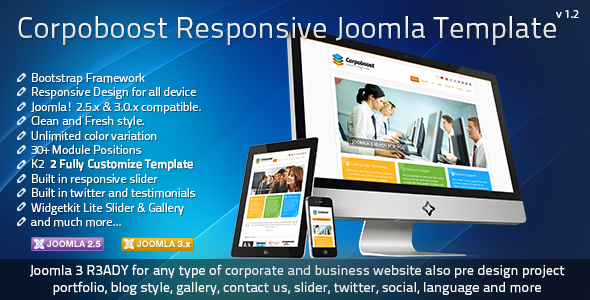 Template is built on top of the Bootstrap Framework and it utilizes new features introduced in Joomla! 3. Visario is a perfect base for any kind of project. “E-Cart” is a fabulous Joomla 2.5 responsive premium e-Commerce template with a standard layout, design and a standard Bootstrap framework.This template creates a specific look and well suited for shop but you can use this template for any simple reservations website.”E-Cart” feels with lots of features and builds with well decorated Helix Framework. It flexible and comes with a predefined suffix class or module class suffix.It is easy to customize and arrives with REAL QuickStart Installation Package for Joomla 2.5, various extensions . 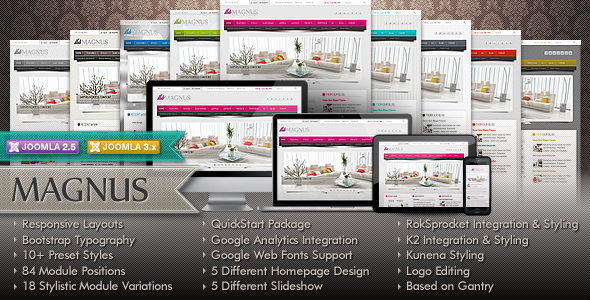 A-T-O-M Joomla 2.5 + 3.0 theme is a clean, sophisticated, lightweight and adaptable business or portfolio Joomla 2.5 + 3.0 fully responsive template. Build with LESS CSS compilation and CSS3 based on gantry framework 4. It has a limitless color variations, k2 styling, bootstrap integration and many more. The theme panel allows to have a limitless control over the theme. 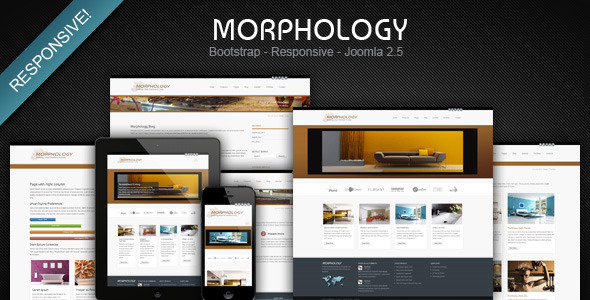 Morphology is responsive Joomla! template that incorporates and takes advantage of Twitter’s very own Bootstrap framework. So for anyone who enjoys their iPad, Android, or even the newer iPhone5, Morphology will adapt to your viewing needs and will still look great as you surf online! This template build for Joomla 2.5.8 and 3.0.2 version with bootstrap framework, you can use this template for your corporate or company or your portfolio site. there have lot’s of features included such as built in slider, joomla core component and module custom design, custom module design with animation, header pattern changer, 40+ background pattern, built in twitter display option, built in testimonials display option, bootstrap style menu with mobile navigation, k2 component styling with blog and project custom template, it’s also have simple image gallery design, Social link styling, language switcher module styling. The RokSmart Template is one of the best light and feature rich responsive template for Joomla build on latest twitter bootstrap framework. It is so easy to develop and control of Joomla templates for you and your website. 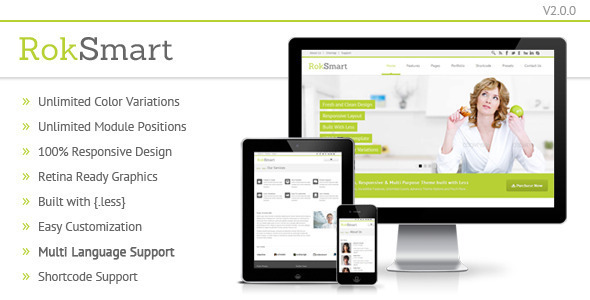 RokSmart will make your experience of creating website much smoother than ever before. This Template ready for use Industries, School, hospital, corporative, travel, fashion, jewellery and any business. Lotus is a modern and stylish Joomla Bootstrap Template. It’s fully responsive and optimized for tablet and any others mobile screen. Lotus will also give you a great portfolio option to work with and it’s very powerful for spa, beauty saloon, hair cut, wellness, yoga, hotel and other various business .It comes with powerful T3 Framework with many extensions which make it total dynamic.